The hundred-and-sixteenth episode of Hand Of Pod sees Sam welcome German/Swiss/Chinese Dan (who is actually English) to his living room, as well as Andrés Bruckner, who makes his HOP debut. Also appearing is Sam’s brother William, who’s in town for a couple of months. Topics up for discussion are Racing and Independiente’s new managers – both have been announced since we last recorded – Argentinos Juniors’ fine start to the season, River Plate’s continuing awfulness, Estudiantes’ renaissance, and the various Copa Sudamericana ties (as this episode is uploaded, River and San Lorenzo are approaching half time in the second leg of theirs). The uploading of this episode was delayed by Jewish new year festivities – Sam’s girlfriend is Jewish – so a belated Shana Tová to all our Jewish listeners! Mystic Sam’s predictions, as ever, are below. You can click here to subscribe to us on iTunes. Don’t forget you can follow us on Twitter and subscribe to us on iTunes. And if you’d like a look at Mystic Sam’s league table and the Best XI, you’ll find them below. The hundred-and-ninth episode of Hand Of Pod sees Sam, English Dan and Santi return to discuss an eventful week in Argentine football. Independiente were relegated last Saturday courtesy of a 1-0 defeat at home to San Lorenzo; Newell’s Old Boys won the championship on Wednesday without kicking a ball as Lanús – who’d thrashed River 5-1 on Sunday – failed to overturn a 2-0 half time deficit in completing their postponed match against Estudiantes. 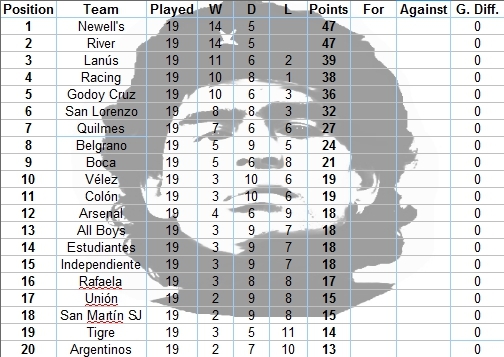 We discuss how deserving Newell’s win was and look at how they and Independiente had such wildly different seasons, having started 2012-13 on exactly the same (poor) standing in the relegation table. As ever, there’s a lot more besides. As ever, Mystic Sam’s predictions are below the line. And don’t forget you can subscribe to us on iTunes!